"This creamy and cheesy slaw is incredible topped on burgers, in pulled pork wraps, beside a steak, or on its own." Combine sour cream, mayonnaise, apple cider vinegar, mustard, and sugar in a bowl; stir until evenly mixed. 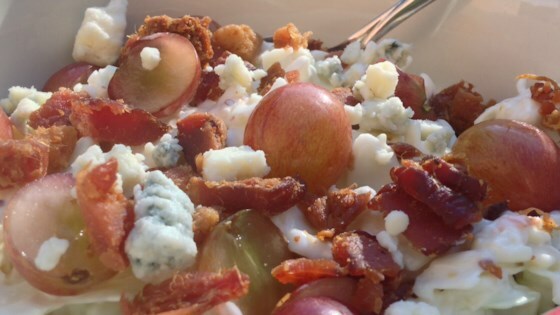 Fold in blue cheese crumbles; mix in cabbage and carrot mix and grapes. Season with salt and pepper. Top with chopped bacon. Refrigerate coleslaw until sticky and wet, 8 hours or overnight. Sprinkle with extra blue cheese if desired. So yummy!! I used honey Dijon instead of stone ground mustard and I omitted to grapes (might add tomatoes at serving time) but omg this is my new staple! !